“Everyone smokes pot.” I’ve heard this from dozens of students throughout Connecticut. Having grown up in the era where the athletes drank and the “burn outs” smoked, I was surprised when I first heard from one of my student-athlete clients that all of his buddies on the lacrosse team smoked. This was a decade ago. Unfortunately, I now hear that most high school students view pot in the same way our generation viewed beer. While I am keenly aware of the hypocrisy from those – including myself – who have a more favorable view of beer than pot, I can’t help but have concerns about the widespread overuse of pot. Despite being a former criminal prosecutor and one of those rare birds who never tried any drugs (other than alcohol! ), I am not an anti-legalization marijuana crusader. I’m genuinely ambivalent on the issue. But I am not ambivalent about the over use of marijuana by teens on the Connecticut. 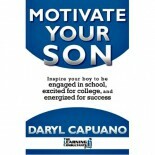 Due to Motivate Your Son, I receive daily inquiries from parents in Fairfield County about lack of school motivation form their teen boys. Of course, I also get similar requests for help from parents of teen girls but, perhaps because of a combination of gender imbalance on the issue and the book, the ratio is likely 4 to 1, boy to girl. There are many root causes for lack of motivation. The book addresses some of the issues from a personality perspective. By observation, marijuana use is usually not the root cause of motivational issues but is the accelerant that transforms normal teen boys with normal teen motivational issues into serious motivational issues. Not everyone smokes pot. Try to make sure your child is one of those exceptions. I’m also a realist. It is as commonplace as drinking beer was back in the 80s. If that is the case, then, despite my personal misgivings, I realize that most social teens will occasionally use marijuana and most will claim that occasional use is not a big deal. Maybe, that’s true. But I can say with certainty that those who regularly smoke pot lose motivation. Make sure that your child is not a regular user.